I am a crafty person. I always have been. I remember long days sitting at the porch table and drawing, or cutting out some fabric to make my first handmade outfit. I even did the trendy mismatched pattern thing. Growing up was all about doing some kind of art project or another. So naturally, I was beyond excited the very second Baby T could hold a crayon in his hand. All of a sudden, I was spending unwarranted amounts of time looking at art supplies online and saving up toilet paper tubes. It was time to get started with the craft projects! When it comes to creating with kids, I’m all about the process. Nothing bothers me more (well . . . maybe a few things) than when someone says, “I am a terrible artist. I can’t draw anything that looks like anything.” Art isn’t about realism; it’s about how you feel when you’re making it. That said, it’s been a little challenging trying to come to terms with what Baby T is actually ready to accomplish when it comes to doing craft projects for kids. Some projects that I feel he’ll be completely into are a total bust. Other times, he’ll surprise me by staying focused on a project for — gasp — thirty minutes! Don’t take out more supplies than you can put away in five minutes (with a cranky toddler hanging from your leg). You never know what your toddler will be interested in, and if he decides that he would rather use the bookshelves as a ladder, you’ll be left with a messy project to clean up while trying to manage your toddler at the same time. Keep it simple: if you’re painting inside, use a set of watercolor paints rather than squeeze a bunch of tempera onto paper plates. Keep a roll of art paper handy. We unroll a four-foot piece and drag it into the kitchen when he wants to paint, then put it away in the garage when he’s done. When he fills it up, we begin using a new piece. Remember — it’s about the process, not the product. During the winter, I was all about going through themes with our crafting. We made a snowman out of construction paper circles and taped it to the back door. I also thought it would be fun to make a paper mache igloo. I figured Baby T would like the feel of the paper mache between his fingers, and he would like spreading the gooey newspaper strips over the balloon. He really liked taking the newspaper strips that I was tearing up and collecting them in one of his buckets. His next step involved carrying the bucket around the house, looking for other buckets to dump the strips into. Back and forth the strips went from bucket to bucket. When he finally got bored with that, I showed him how to dip the newspaper strip into the flour glue. (I might have tried a little too hard to coerce him to the table for this part.) Boy, did he not like the way that felt on his hands! I was dead set on making an igloo, though. After he decided this was not his kind of project, I finished it, waited for it to dry, and made an igloo. At which Baby T never looked twice. He would have much rather spent the afternoon playing with the newspaper strips. Think big — kids like to see things happen. When you’re doing a project with a toddler, if they can dump out an entire container — of glitter, tissue paper squares, pompoms, or anything else messy, sticky, or tiny — they will. Toddlers are all about gross motor skills, which means when they do art, they don’t want to dab glue on the paper. They want to dump it out and make a river out of it. I was making Easter egg place mats with Baby T that involved sticking tissue paper squares to contact paper. All he wanted to do was dump the bucket of tissue paper onto the contact paper. He was all about the motion and the action/reaction. He’ll still tell you “mommy made the place mats” if you ask. Because I did. He played with the tissue paper. I’m slowly learning, though. I recently made chalk paint with him. That was a hit. He liked using the different containers to squirt the paint onto the driveway. It wasn’t even so much about what the paint looked like on the driveway. I think he just liked squeezing or pumping the different containers. 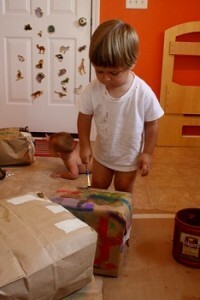 Since toddlers tend to use more gross motor skills when doing projects, encourage this. Set up the project on the floor or on a low table that they can reach. Let them move around and get to know the materials. Asking them to sit at the kitchen table can lead to frustration. They don’t have much freedom of movement, and they may continually try to hop on and off of the chair. When you do art projects with a toddler, if you envision that they are going to recreate Van Gogh’s starry night, you are going to be sorely disappointed. “Okay, that’s a given,” you’re thinking. If you expect the glue to go on the paper and the glitter to go on the glue, you’re going to end up quite disillusioned when the glue ends up on the arms and the glitter ends up in the shoes. 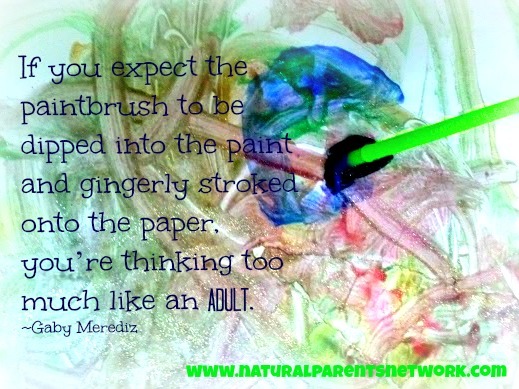 If you expect the paintbrush to be dipped into the paint and gingerly stroked onto the paper, you’re thinking too much like an adult. This is coming from someone who cringes every time she sees a dry paintbrush being pushed against the grain on a piece of paper—it’s like nails on a chalkboard. Every once in a while, I might point out that wetting the brush and then dipping it in the paint will make the color show up more. But I have to bite my tongue. If all your toddler is interested in is seeing the bristles splayed out against the floor, so be it. I recently made blocks out of cardboard boxes that were in my recycling bin. I covered them with brown paper from grocery bags and gave them to Baby T. “Maybe you could stack them up,” I suggested. He kicked one across the floor. 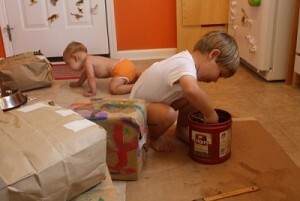 A few days later, we were painting in the kitchen, and Baby T was asking for his blocks. I brought out the bucket of small wooden blocks that he usually plays with. “No, I want blocks! In recycling!” Okay . . . I brought him the blocks I made, and he spent 45 minutes painting them. Give your toddler the tools and sit back and watch. You’ll be amazed at their creativity. Toddlers have fresh, unmolded, enthusiastic ideas. They don’t know what to expect, and you’ll be surprised at what they come up with. Gaby grew up sewing, drawing, and crafting, but went through a lull in her creativity after graduating from college. Even though she had all the time in the world, something was missing. Then she became a mom, and everything fell into place. Now, her inspiration runs rampant, and she is constantly researching and writing about her experience with natural parenting, breastfeeding, babywearing, and just plain raising her two sons. She shares her passion for birth and babywearing as a Lamaze and babywearing instructor, and she opens up about her experiences with natural parenting, crafting, and natural living in her blog, Tmuffin.com. In her ever-elusive free time, she can be found outdoors with one baby strapped to her while she chases her toddler. Family Draw Time Art Show — Kate Wicker shares art (and inspiration!) from her family’s cherished tradition of family draw time. The Rules of Creativity: Learning to Create with the “Non-Creative” — Zoe at Give an Earthly shares how she learned to accept her “non-creative” child and claims that anyone, child or adult, can be creative given the right handling and environment. Creating memories, not things — Mrs. Green from Little Green Blog reflects on life with a ten year old and how ‘creating together’ has evolved from ‘things’ to memories. Home School Music – Sparking A New Generation Of Musicians — Based on her musical background, Chante at My Natural Motherhood Journey talks about how she creates with and teaches music to her children. We’ll always have Halloween: Creating costumes for kids — Jessica Claire at Crunchy-Chewy Mama is not the craftiest mom on the block, but she does make a mean homemade Halloween costume. Let’s Make Juice! — Wendylori at High Needs Attachment shares about the benefits of juicing with kids, as well as a quick recipe. Everything’s Better When It’s Homemade — Amanda at Let’s Take the Metro praises the art of homemade goods. 10 Easy and Functional Crafts Preschoolers Can Do with Minimal Assistance — Dionna at Code Name: Mama offers ten easy crafts preschoolers can do while sitting near parents — but they don’t need a lot of parental help. Added bonus: all of these ten ideas double as something functional (gifts, decor, educational). Creating Together in the Kitchen — Despite not feeling “crafty,” Momma Jorje finds a way to create and connect with her toddler. An Artist-Mama’s Perspective — In this post, Shannon at The Artful Mama discusses the differences between her choice of artistic outlet and her son’s, and how they embrace those differences together. Creating with Children – The Nature/Seasonal Table — Jennifer at Hybrid Rasta Mama celebrates the rhythm of the natural world with her toddler through the creation of a seasonal nature table. These are amazing tips Gaby, I especially love the one about altering expectations and biting your tongue. That is something Tom and I have been working on a lot – not just with art, but with *everything* – we have to stop and remind ourselves that even though our 3.5yo seems so grown-up, he’s still so little, and he’s entitled to experience the world in his own way and make his own “mistakes.” Thank you for sharing! Great ideas! I especially love focusing on the process, not the product. When I’ve done craft classes with my daughter I felt like the parents were doing more of the project than the kids so that it looked “right”. I let my daughter explore on her own, then she likes it more. This is such helpful advice! I am not artistic – nor do I enjoy creating art – but that just makes me appreciate it more, and I want Baby to explore art as much as possible. This makes me feel more capable of getting him going with it. some fantastic advice – in particular to get rid of expectations and to focus on the process not the product – thanks so much for sharing your wisdom! Those are awesome tips! I can totally relate to the tip to “think big” . . . I actually did the contact paper and tissue paper craft at Christmastime, with little trees, etc. It was so frustrating because all Abbey wanted to do (at just 2 at that point) was throw tissue paper around. *sigh* Thanks for the tips! Thank you for these tips. I think I get more caught up in the project and not the process. This was a great reminder to focus more on the process of it and to let go of my expectations. Thanks for all the comments! It’s so interesting to read all the posts from this carnival, because they are all great reminders about how to bring out creativity in children. And as much as I’m into the process when it comes to art, when it comes to baking, it’s a whole different story… I have to remember it’s all about the process then, too, and my muffins may not be perfect because a scoop or two of flour might be missing! Watercolor paints! What a great idea! Your other suggestions are also very helpful. I’ve tried to provide the opportunity for mess making, but I’d forgotten about the gross motor skills aspect. Thanks for the great tips! Do you by any chance have a homemade recipe for chalk paint? I’ve been pretty go with the flow with our toddler, but every once in awhile I set my expectations higher than the bare minimum (my minimum expectation is that toddler finds the project amusing and I see that she’s developing skills while having fun) and I’m sorely disappointed. Thanks for the reminder that projects feel the best when you’re most excited about toddler’s happy face.